This is the view of the aircraft as seen from above. 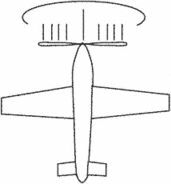 The rotation of the propeller is clock-wise. Accordingly, the right blade is going down at instant of the illustration. The downgoing blade is at a higher angle of attack than that of the up-going blade. Hence, asymmetric wing loading. The loading of a propeller disc in such a way that one side produces more thrust than the other side. A steel ball joint was used between the steel plate and the jack in order to permit rotations and avoid the transference of moments, especially in cases of asymmetric loading. For slabs with asymmetric loading the failure surface was steeper for the region between the load and the closer support, reaching a maximum of 67[degrees] for slab M-12-480. T129 ATAK with the best of class power to weight ratio has crashworthy design to MIL-STD-1290 and incorporates multi weapon asymmetric loading capability. When considering the case of asymmetric loading, distributed vertical force q = 20 kN/m acted on a half of the span and q = 10 kN/m was applied to the other one. According to differences less than one percent, the computational method can be efficiently applied to the structural analysis of the under-deck cable-stayed bridge with the double-level cable-staying system both for symmetric and asymmetric loading. According to possible live load models for footbridge design, the case of symmetric and asymmetric loading was considered and configurations of load q = 10 kN/m were used as shown in Fig. In the case of asymmetric loading, the main highest tensile and compressive stresses are formed in the girder on which the design HK-80 load is applied. The specimens were tested under symmetric and asymmetric loading and strain data was recorded up to crack initiation. It was mentioned earlier, that in real constructions most common is the asymmetric loading, which results that hysteresis loop's width [[bar. The lifting belt reduced the peak normalized EMG of th e erector spinae muscles on average by 3% during asymmetric loading, though peak normalized EMG was increased by 2% during symmetric loading. During asymmetric loading, the two pulleys were set 45 [degrees] to the right of the midsagittal plane. The added interconnectivity, asymmetric loading capability, and high downlink power levels will facilitate use of small receive systems by Internet Service Providers and other Internet users as well as more cost-effective and efficient data delivery services.